This photo shows The Hurlers, a group of three stone circles arranged in a line on Bodmin Moor, in Cornwall. I visited the stone circles and took the picture above while I was on holiday in Cornwall last week. 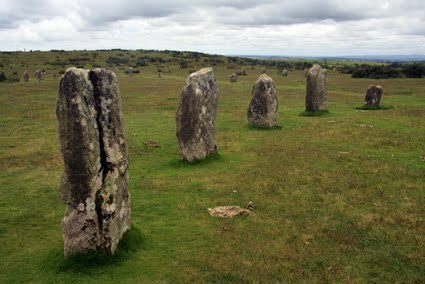 It is in a very atmospheric location and probably has the best preserved stone circles on the moor. Another good thing about them is that they are free to visit and you can park nearby. Archaeologists think the ceremonial megaliths date from the Neolithic or early Bronze Age. They are called The Hurlers because of a local legend that says men who were playing the game of hurling on a Sunday were magically transformed into stones as punishment for doing fun stuff when they should have been in church. The Hurlers are managed by the Cornwall Heritage Trust on behalf of English Heritage.